17 blog posts and 71 contacts in her email list was all she had when she launched her first digital product – an online course. The product went on to make over a thousand dollars and gave birth to new customers and new ideas. I loved her story because it did a couple of things to my mindset. Number one, it made me understand that you don’t need to know everything before you launch your digital product and secondly, it gave me the assurance that if you put in the work, success will be waiting for you at the other end of the bridge. The lesson from her story is, you need a foundation before you launch your digital product. And blogging is the perfect foundation to start. Well, that’s what this blog post explores. Have you ever watched Ellen Degeneres? If you have, you’ll notice a lot of people sitting down in the studio. And, there are also a lot of people watching her show at home. All these people watching are her audience. They watch all her shows, buy all her merchandise, and, in simple terms, adore her. Because she has entertaining content. Her content keeps her audience entertained and satisfied. While most of her content is in the video format, the concept of building an audience is the same which is, consistent and entertaining content attracts people. Your blog is your studio where people come to read your posts and comment. You need to ensure that your content is engaging. Building an audience is important because your audience is most likely to be your customers. Hence, from the start, you need to have a proper strategy on how you intend to build your audience with your blog(I will show you how to build an audience in a later post). One of the six principles of persuasion is authority and writing every day on the particular topic gives you authority. Because your audience knows that you can answer most questions they have regarding your topic. For example, Neil Patel is an authority when it comes to online marketing because when you visit his blog, you can find the answer to, perhaps, most questions related to online marketing. The same can be said about Copyblogger when it comes to content marketing because when you visit the blog, you get tons of information about content marketing. Consequently, if Neil Patel or the guys at Copyblogger release any digital product, you rest assured of buying quality, well-researched information. 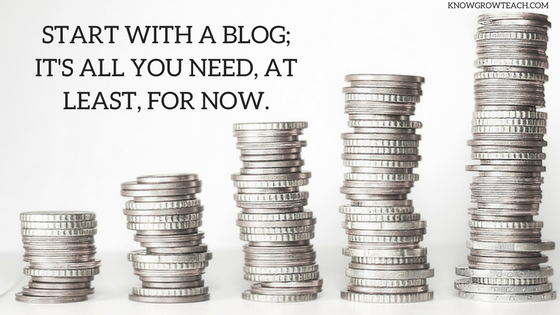 And the only way to gain authority, especially in this digital world, is through your blog. Putting out quality content on your chosen topic day-in-day-out builds your authority and when you are ready to launch your first digital product, you’ll be seen an expert in your field, making it easier to sell your product. Wouldn’t it be nice if you had a mechanism to improve your product consistently? That mechanism is called feedback. Feedback is a vital aspect when developing a digital product because having feedback enables you to make necessary adjustments to your product. And the best way to get feedback is through blog comments and engagement with your audience. If you write a blog post about blogging, for example, your audience might have issues or suggestions that you probably didn’t imagine. So, you can use their observations to re-edit the post, making it better. Not only does it make it better, but it also makes your audience feel important and relevant which is an essential part of growing an online business. People buy from people they trust and a blog that is transparent and extremely helpful builds trust. The online business world is different from the traditional business world because, in the latter, you have the opportunity to meet potential customers face to face and build trust. On the other hand, online businesses don’t have the luxury of meeting potential customers. The only sure thing you have for building an online business is your words and superior products. Your words are the content you publish on a daily or weekly basis. It has to be helpful, engaging and consistent. Your reputation includes; your about page, your blog design, your response to comments and other factors. If you pass the trust test, your digital products will fly off your system like butterflies in spring. Uniqueness is an important part of building a digital business because, as you may be aware, there are numerous online businesses out there, fighting for a piece of the pie, and standing out is quite difficult. However, your blog gives you the opportunity to build a unique brand. Your logo design, your style of writing, your experiences are all specific to you, and it should reflect your brand. That’s the surest way you can stand out. Writing regularly on a particular topic increases your knowledge. To write, you have to read. Regularly. And, remember the reason why you have your blog. To develop jaw-dropping digital products. So, blogging ensures that you study your topic thoroughly so that you attain a level of mastery. Consequently, your digital product will not lack quality because you can showcase your knowledge of your chosen topic. With the points I’ve shared above – building an audience, gaining authority, feedback, building trust, building a brand, and expanding your knowledge – you can now see why it is important to start off with a blog. Building a successful business takes time, but a blog will ensure that you are on the right path. So, if you are yet to start off, I have a question for you. If you feel lost, you can start with my free online course that shows you everything you need to know about setting up your blog. You can also download my free ebook that shows how to start your blog in 24hours. I’ll love to hear from you. So feel free to leave a comment below.